A reader sent in a tip to BestMVNO that Boost Mobile is currently offering bring your own phone customers an unlimited LTE data plan for $25/month, with taxes and fees included. The phone plan includes unlimited talk, text, LTE data and mobile hotspot. There is an LTE data cap on the mobile hotspot. Only the first 8GB consumed in a month are at LTE data speeds, after that speeds get reduced to 2G. This is a limited time online only offer from Boost Mobile. It will be available until 11/5/2018. It is available exclusively to new customers and port-ins. Boost Mobile does not say specifically what phones can be brought over to the network to take advantage of this limited time offer. Historically the company has only allowed a limited selection of phones to be brought over. Sprint and Virgin Mobile branded phones are ineligible for the promotion. Most eligible phones will likely be those that are universally unlocked from brands such as Samsung, Motorola and the Apple. Boost Mobile does have a device eligibility checker that you can use to see if your phone is compatible. Besides the unlimited talk, text and data, the plan also comes with 50 domestic voice roaming minutes. Like all unlimited data plans on the market, there is a data prioritization policy in place. Customers that use more than 35GB of data in a month may have their speeds temporarily slowed down during times that the Sprint network is constrained. Video streaming is limited to a maximum resolution of 480p. Music streaming is limited to 500Kbps and gaming streams are limited to 2Mbps. A report from Wave7Research indicates that this offer can be found in stores exclusively at Best Buy. The offer at Best Buy is slated to last until 1/9/19. I would not be surprised if the online only offer from Boost Mobile gets extended later to match the Best Buy promo end date. 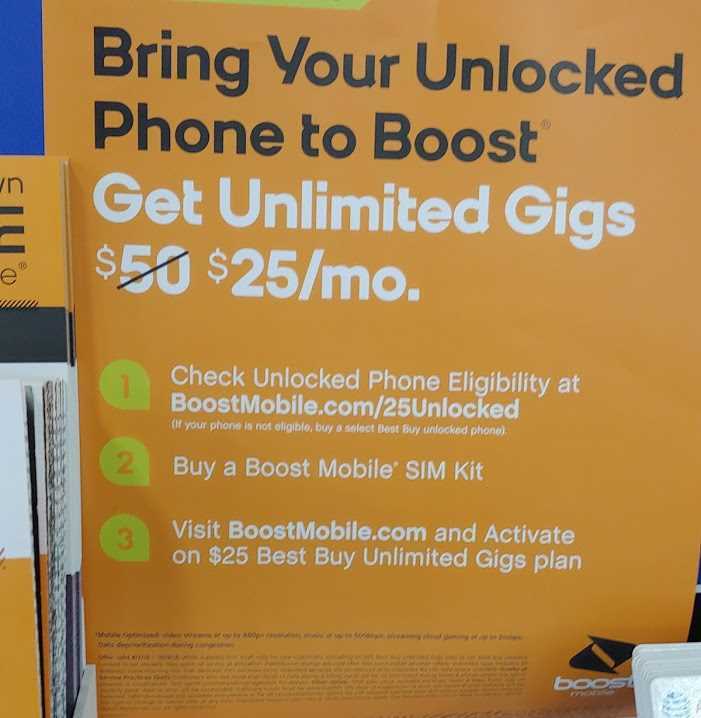 Is there a way to get a clear picture of that Best Buy $25 unlimited plan ad? I’m not able to see the valid till date. Is it recurring discount or only applicable to the first few months? Thanks. For as long as you have the plan. How does one get this at Best Buy? They say they will honor the deal if it’s online but it’s nowhere on their websites. It’s in store only at select Best Buy’s.